July 1, 2014 to Jan 17, 2019. This is a study to see if the results shown in my Arizona study for this basin can be improved by subdividing the 610 sqmi basin into 5 sub-basins and also to show that my continuous Curve Number loss method can produce successfull results (OR NOT) this far from radars and with very sparse rain gages. Quite a challenge. 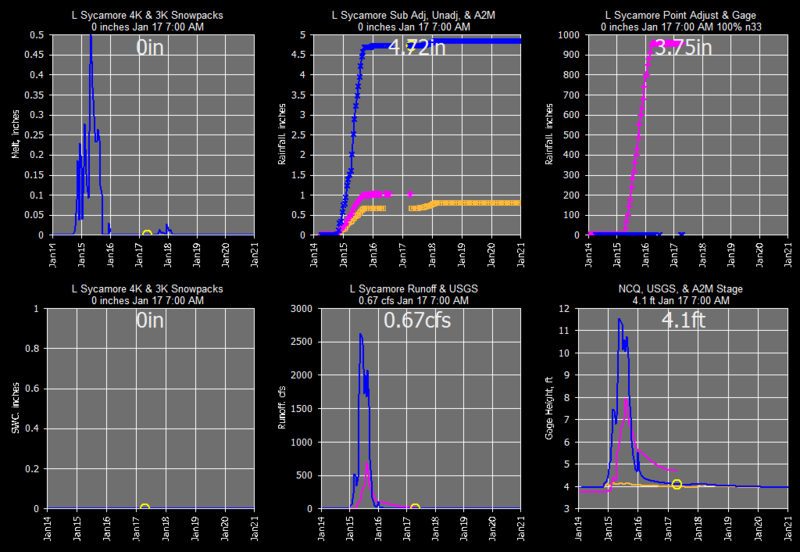 A composite of all nearby radars was compared to the nearest to see if that helps (OR NOT). 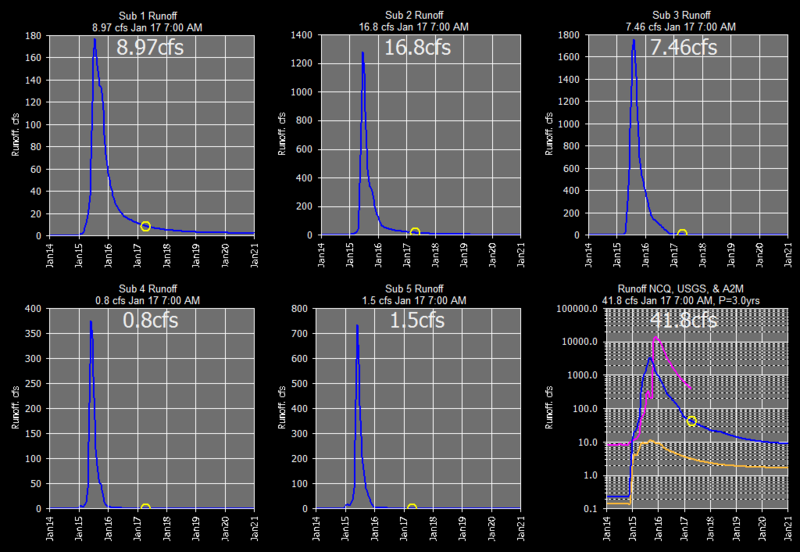 The Burro Creek USGS flow gage is not the best either with A LOT of shifting control. 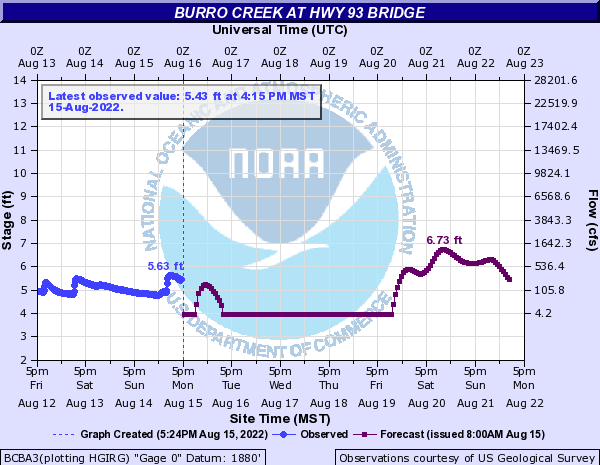 Burro Creek at the USGS gage near Bagdad, AZ goes to zero flow for a few months most years in late spring and resumes flows with the summer monsoons beginning in July. 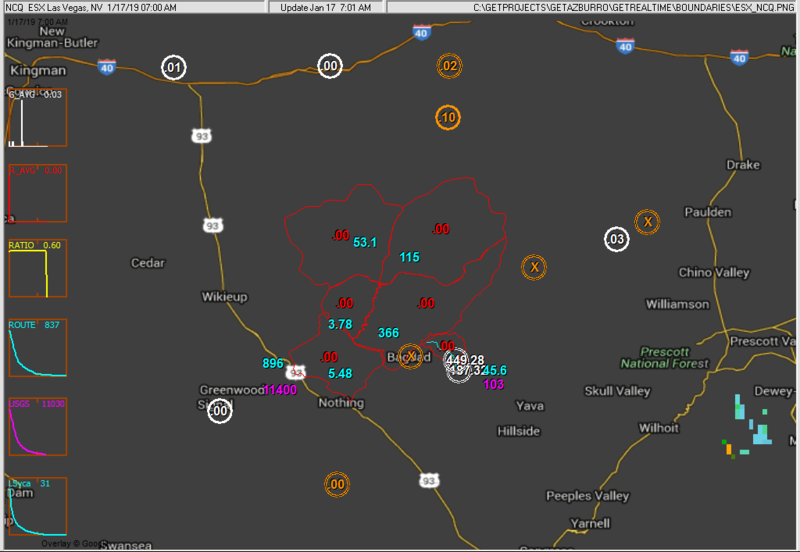 Below is my GetNexrad N0Q radar area 114 miles southeast of the ESX radar, Wundergages (white), adjusted N0Q radar (red) at watersheds, computed runoff (blue, and USGS gage flow (violet) over the Burro Creek 5 sub-basins. Displayed values for rain gages and adjusted radar (W/O forecast) are yesterday and today's sum, other datatypes numbers display yesterday and today's max value in the rdaymax table. 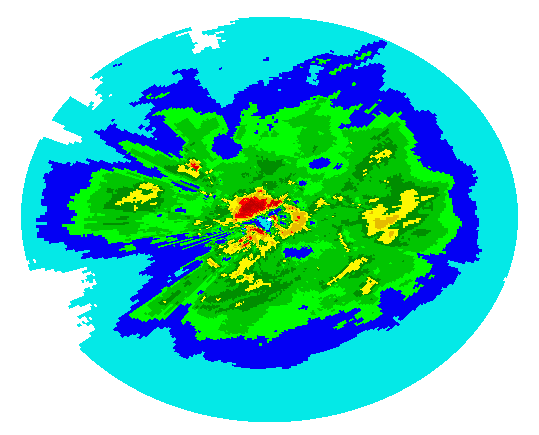 Missing data for rainfall and radar is 40 minutes old and others are 240 minutes old (USGS lag) and the displayed values will be colored orange but thumbnail plots remain the same color. I won't be retrieving radar for clear skies. 5-minute radar N0Q cells are 0.57 x 0.70 miles (1km x 0.5 dBZ). Note that because the large distances between rain gages, up to 56 miles, I decided to use a 1-hour DAILY 2-hour ratio of Gage/Radar daily rainfall average at now 4 gages. The Mean Absolute Error % is shown on thr hourly gage and radar graphs is a gage weighted MAE= Sum G*|G-R| / Sum G*G when gage or radar > 0.05". 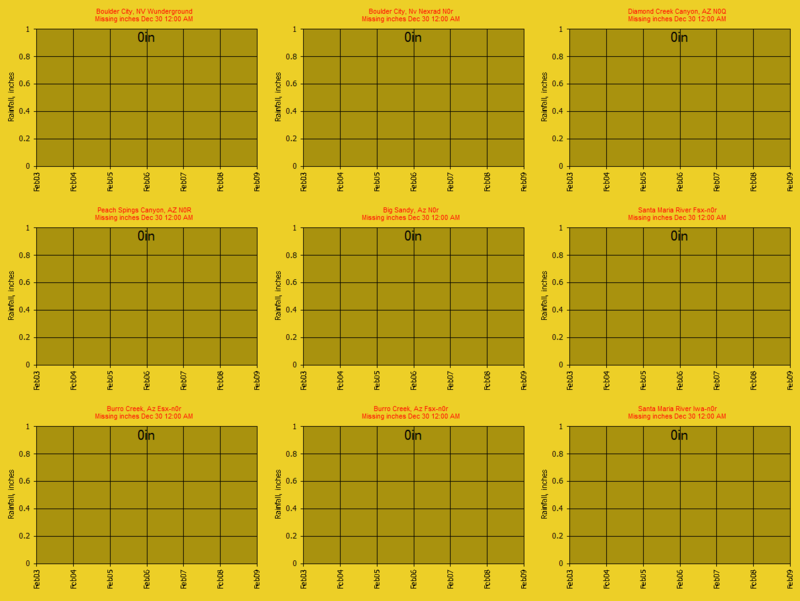 Update 9/11/2014: I have gone to a 2-hour G/R ratio instead of Daily and restarted everything from July 1. On August 26 I had to intervene and mannually set the G/R ratio to 1.5 because of missing Bagdad raingage data to get the soil moisture back on track. The daily or 2-hour gage/radar ratios are used instead of a normal1-hour because of the long distances to the rain gages. Update 8/9/2016: Forget it, I've gone back to 1-hour raios. Update Sep 7, 2016: The unadjusted new PTA storm total dual pole QPE algo product is showing remarkable results this far out and may be a keeper but time will tell. No more frozen rain gages if it holds up. Update Aug 8, 2016: I have added snowmelt computation elevation bands to each subbasin. Each elevation band is 1000 feet. This means snowmelt is computed separately for each zone and then area fraction summed for subbasin melt. Subs 2, and 3 have 3 zones, and subs 1, 4, 5 and L Sycamore have 2 zones. The same precip is assumed to fall on each elevation zone as the subbasin radar average. I don't know if this was needed but seemed like a good idea. Snowmelt is VERY temperature and longwave sensitive... VERY!!! The temperature gage at elevation 5500 ft is lapse rated 3.5 F/1000ft to each band but not longwave nor other parameters so far. The rain gages are just too far from the 610 sqmi basin for reliable radar adjustments. Also the reliable temperature gage for snowmelt calcs is also too far from the basin. 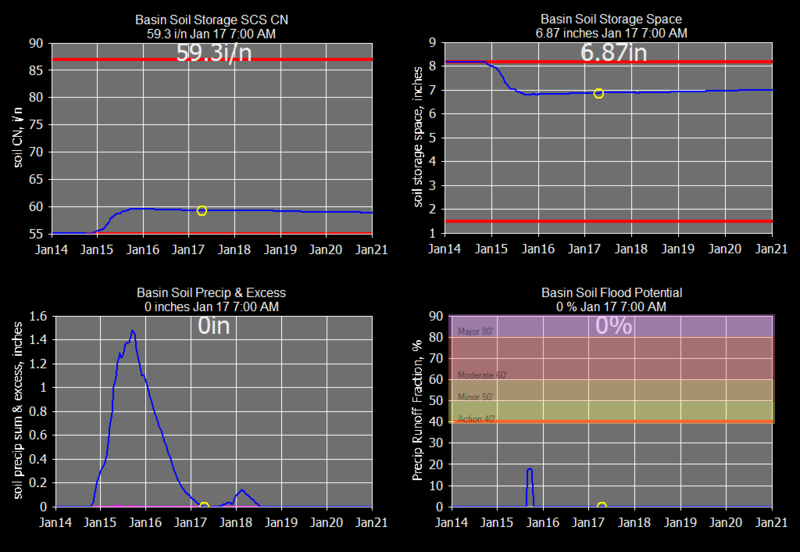 This study will continue in case a Wunderground rain gage comes online with in the basin to verify expected improvement. But for now this study is a cautionary tale of a large basin with no rain gages with in it and shows the limit of radar rainfall adjustements. The adjacent 19 sqmi Little Sycamore basin has 2 USGS rain gages with in it and shows that composite radar rainfall at these distances can be successfully adjusted... maybe... sometimes. Next up is to try the MRMS Multi Radar Multi Sensor product from NSSL A2M. A2M is a 1-km 2-minute rainfall rate with 255 values. The setup site_name is A2M-ESX (for ESX radar) and uses the Iowa map cutting service for the same area as NCQ. The A2M rainfall will NOT be gage adjusted. Update Jan 17, 2019: The unadjusted A2M Multi-Radar Multi-Sensor Rain Rate is a complete bust for winter rainfall. 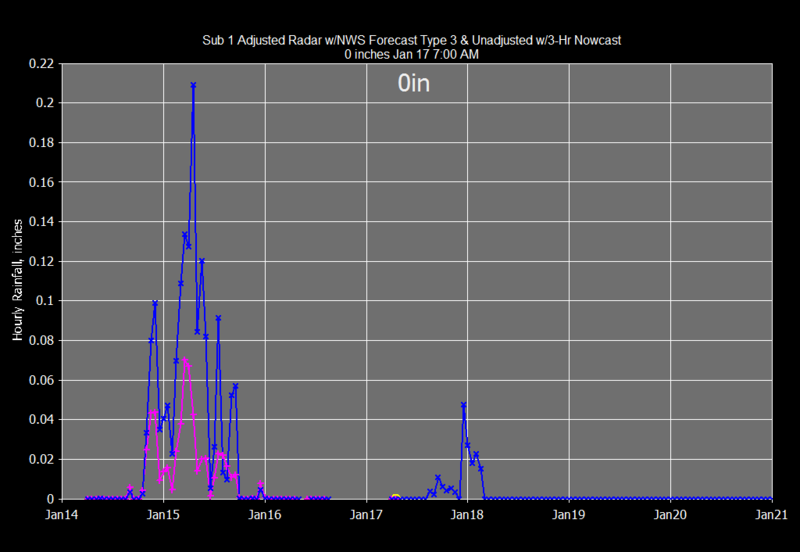 The adjusted NCQ radar is WAY better for winter even with it's VERY poor rain gage location distribution. I think I've seen enough of A2M and don't recomend it. Study terminated. Beginning Oct 7, 2015 radar product NCQ Iowa Composite of all nearby radars will be used. Once the temperatures start dropping the ESX radar cannot see the lower statiform rainfall and you can't adjust zero radar. ESX is 100 to 125 miles from the basin. Why the other radars can see better I don't know. Ah, the Las Vegas and Phoenix radars are both 124 miles from Bagdad but Vegas mid-beam scan is at 19,400 ft vs Phoenix at 16,000 ft. Flagstaff radar is actually a bit closer but scans at 20,000 ft Along the basin centroid distance both Vegas and Phoenix radars are scanning at the same 18,000 ft. So it's probably a hodge podge of radars being composited adding more guestions for adjusting with rain gages so far apart. Time will tell. One finding is tha the N0Q ESX radar adjusted with only a rain gage at the farthest distance will (may) overestimate the basins nearer to the radar and significantly exceed the ajusted NCQ radar for those nearer basins so contrary to what I thought, that's a plus for NCQ. Also the 2-hour ratio is significantly worse than a 1-hour ratio adjustment for the basin the gage was in. Win some lose some. I tried the Day, 2-hour, and 1-hour ratio and conclude that the 1-hour is best so this concludes the matter. White rain gages ON, black OFF, and red basin adjusted radar are for yesterday and today thru now (no forecast). The two rain gages north of highway I-40 are not being used. Blue values are peak flows for yesterday and today. Violet value is USGS flow gage peak. 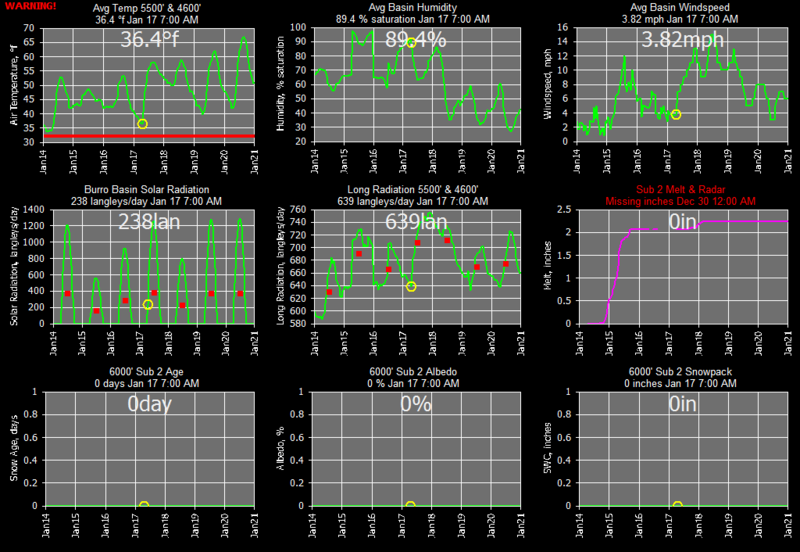 Plot boxes are hourly values for yesterday and today. Orange values are more than 30 minutes old. Both I and the NWS stage should compare well on forecasts because the same forecast is used, but for current peaks, then who has the best adjusted radar product will start to show. This huge basin is miles from nowhere with sparsely located rain gages so NWS might have the better deal with their radar methods geared for large areas.... we'll see... but when it's raining at a gage, then it aint raining over the basin. Note "Foecast (issued...)" time on graph below. Also my 3-hour Nowcast is being compared to my distributed NWS 6-hour forecast on my web page here and should easily out perform (usually) the NWS methods for the next hour or 2. 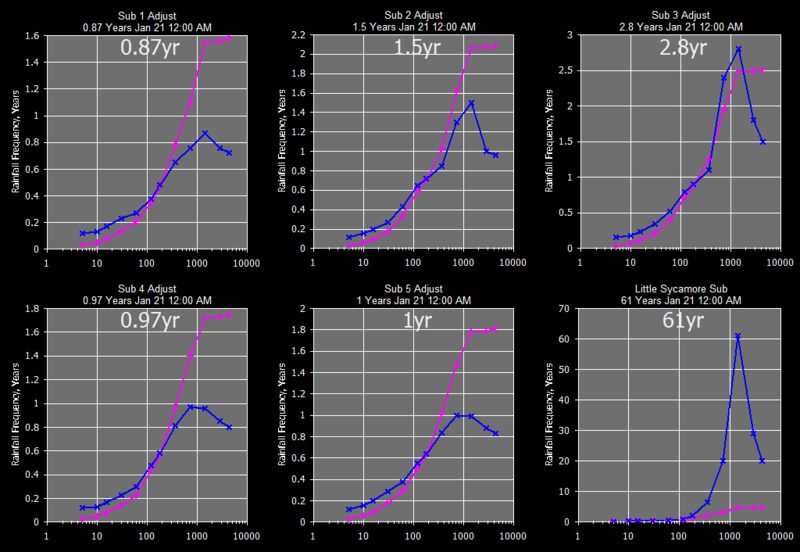 I'll try to keep track of some NWS current peaks a few hours out before lost to observed. If the NWS has better luck with this basin than I've had, then I'll try one of their precip products or use an hourly product to adjust the 5-min radar instead of rain gages but what I've seen of PTA vs these gages they aint in the ballpark but sure make runoff look good... zero. Update Jul 28, 2017: Now besides the 3-hour Nowcast on NCQ and A2M made by moving the subs up wind for 3 hours and the NWS distributed 6-hr blocks for 7 days, the new HRRR 15-minute block 18 hour forecast is included for just 3 hours after the 3-hr Nowcast. I don't think the NWS is using the HRRR forecast so I better watch out too. 2016/8/27 5PM 4.75' 10:10AM 6.89' 7:00AM >9.80' DIFF +1.74' +5.0' 32% 73% 48% final 0.39"
I don't think NWS updates their daily morning runoff forecast until something big so I can clean their clock till then?.... well that was wishful thinking. S=0.03669, R=4.093 so N=0.088 at 4900 cfs, Lag=3.0 hrs. I'll use Lag=4.0 hrs with Variable Lag as I think I did above and see how that goes for now. Now all we need is for the USGS to start providing flows at this new gage and we shall see how we did here. Unitil then, I used Google Earth for a slope conveyance rating just above the gage to estimate flows from bubbler G.H. Update Feb 16, 2017: USGS is now providing flows and will be used hence forth. The USGS rain gage(s now 2) on Little Sycamore will be used to adjust the NCQ basin radar rainfall along with others, then the same ratio used for the 5 subs above will be used to adjust this L Sycamore sub and point rainfall at the gage to see how bad radar adjustments are at this distance. Seems the USGS L Sycamore rain gage has been down for a month now and shows no signs of returning to service so we shall see.... ah, they changed the station ID number to a lat/long form so we're back in business. Current flows. No USGS flow rating yet, just a poor estimate from USGS GH.... USGS now reporting flows as of 2/16/2017. I was OVER estimating flows by twice but I'll let them stand as history only. More Little Sycamore history at bottom. Months 7 & 8 using 2-HOUR RATIOS: The basin is just too far from the ESX radar for low winter storms and so suffers severe overshoot. Using Iowa NCQ highest reflectivity from nearby radars is even worse. Months 9 & 10 using 2-HOUR RATIOS: The basin is just too far from the ESX radar for low winter storms and so suffers severe overshoot. Using Iowa NCQ highest reflectivity from all nearby radars is even worse. Just when things were looking so good until Aug 26, 2014, then the ESX radar shows dbz values as high as 75 dbz over the lower basin on Sub 5. The radar had a hail cap at 55 dbz so no problem I thought. So how come the USGS peak flow is 7,950 cfs and my adjusted radar says only 34 cfs. SNAFU and FUBAR to the max!!!... no matter what gage or gages are used in adjustments. I tried raising the hail cap to 12.48 in/hr at 60 dbz (100-yr 5-min rain=1.04") and got the same results because of a lower G/R ratio adjustment. I also tried raising the hail cap to 62 dbz at 18 in/hr with the same results. 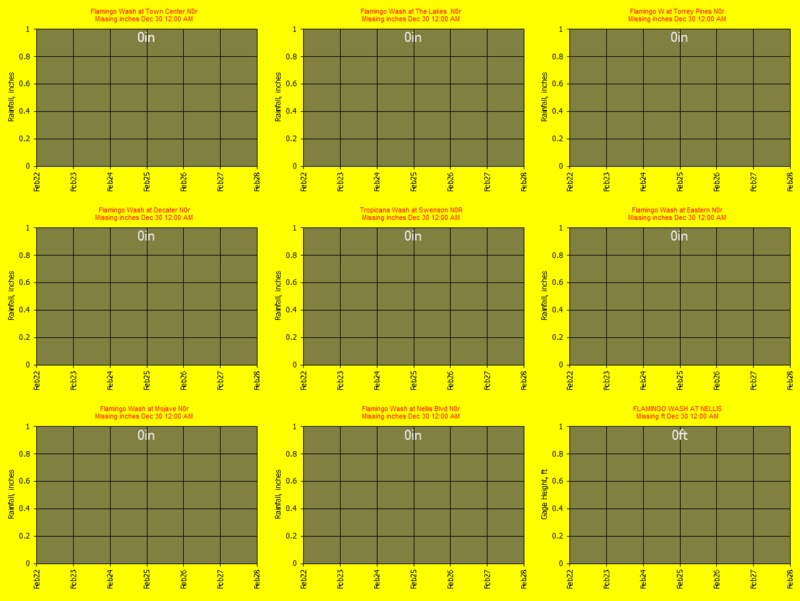 I also tried HOURLY G/R ratioing with same results. The daily G/R ratio would need to be raised from my observed 0.38 to 1.5 in order to get the USGS reported flow peak. Entirely possible but the Las Vegas ESX is so badly calibrated that the typical ratio is 0.5 in the Burro Creek area and 0.25 in the the nearer to radar site Las Vegas area. The rainfall that produced the peak flow was mostly over Sub 5 and the radar's unadjusted rainfall for that hour was 1.70 inches and would therefor need to be 1.5*1.7 = 2.55 inches for the hour or about a 25 year 1-hour storm. How I would ever get there is beyond me because the nearby Bagdad Wundergage had a G/R ratio of 0.42 for the hour. I will chalk it up to the crappy ill tempered Bagdad rain gage that probably missed half the storm. The further away Big Sandy USGS rain gage ratio was 0.33 with only one radar dbz near hail at 53 dbz with 1/2 the rainfall as reported at Bagdad. The USGS peak flow recession looks flawless so I don't expect the USGS to change the flow much if at all. To update the soil moisture back into the ballpark for Sub 5, I set the August 26 G/R ratio to 1.5. I tried all the combonations of gages, defualt ratios, curve numbers, and initial losses and could get good results only storm by storm. 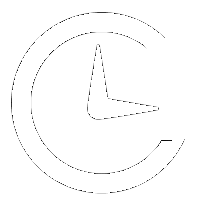 I also tried hourly and 2-hourly ratios with good results some of the time. I think the problem is the poor rain gages at Bagdad and Camp Wood and the quickly shifting G/R ratio both temporilly and spatially. So I will just stick to daily ratios with poor gages and hope the winter storms are easier to deal with. You just can't make a silk purse out of this cow's rain gages. The rain gages are just too far and just to wrong. I can't even find Wood Camp and Bagdad gages in Google Earth visually so who knows their locations. The hourly adjustments was a disastor, but the 2-hour G/R adjustment was a bit better than Daily so I have started over with 2-hr G/R ratios. Update May 1, 2015: Camp Wood, Goodwin Mesa, and Bagdad rainfall records are no longer available on Wunderground. 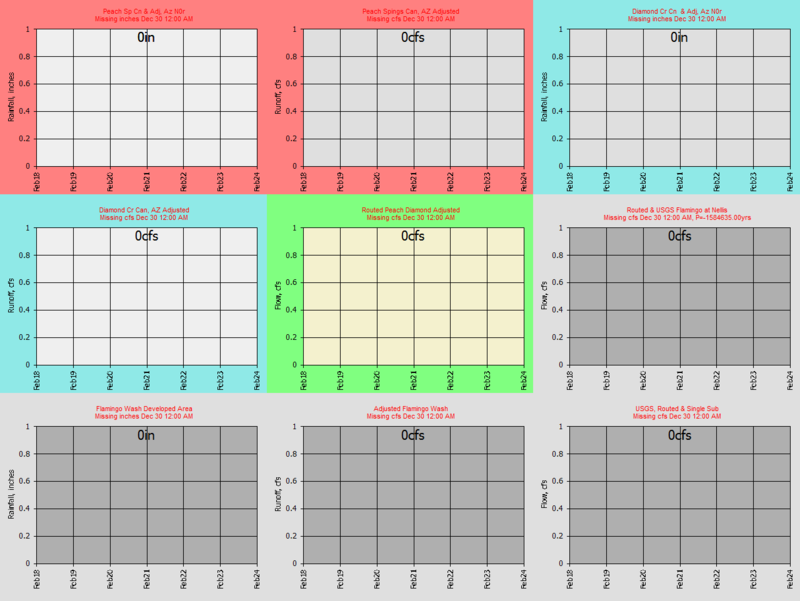 So now I'm relying on Sierra Verde #1, #2, and USGS Sandy River for gage/radar ratio adjustment. Hopefully these 3 discontinued rain gages within the basin will return to service someday. Update Jun 12, 2015: USGS Little Sycamore Ceek rain gage added so 4 gages now availble for ratios. Update Oct 1, 2015: Wunerground rain gage LV Ranch KAZPRESC90 added but is pretty far east. The radar range lines shown here are 100 and 125 miles from the ESX Las Vegas radar. Subs 1 and 2 are combined and routed to Sub 3 and 4's outlets and combined. Subs 1, 2, 3, & 4 are then routed to the USGS gage and combined with Sub 5. Little Sycamore Creek: No USGS flow rating yet, just a poor estimate from USGS GH. 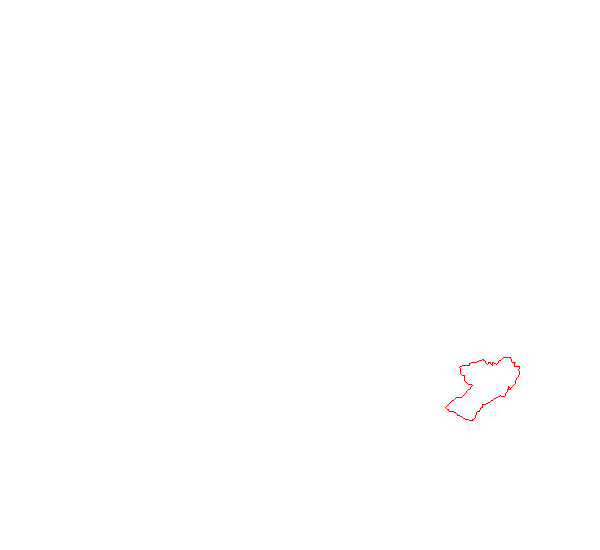 Copyright 2014-2019 Carson, Reproduction permitted with attribution.